Integrity is so important when you write about your travel experiences; and even more so when you proclaim the importance of living life beyond fear – as we do. So when I had the chance to walk my talk I took up the challenge! 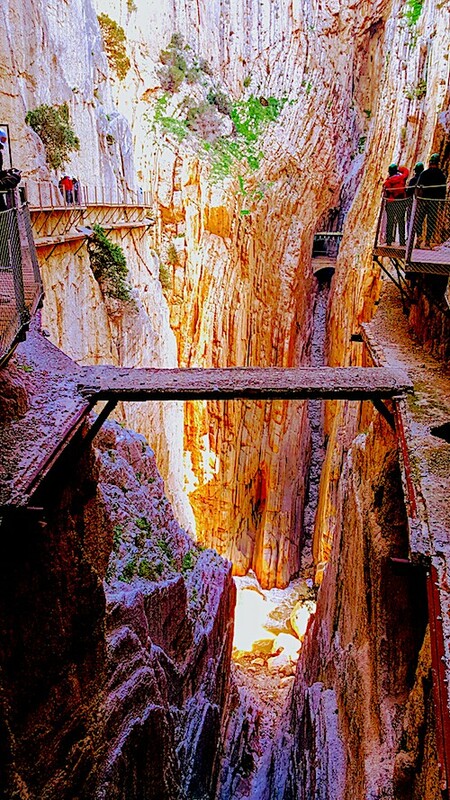 El Caminito del Rey in the Malaga region of southern Spain is a notorious gorge walk, which is famous for perhaps all the wrong reasons. 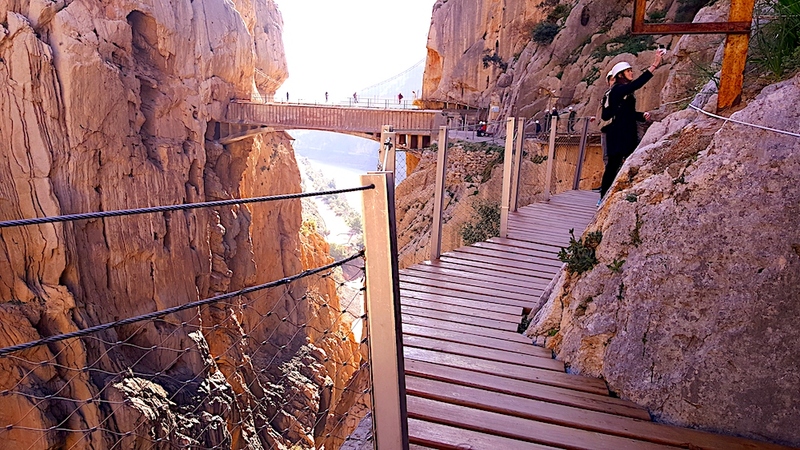 Once crowned one of the most dangerous walks in the world, with death-defying climbs, 100m + impenetrable gorge walls and narrow, suspended boardwalks with only a small piece of concrete and a few planks of wood supporting you. It all sounded pretty frightening to me as a girl who loves to feel safe and not take un-calculated risks. Although, you know the sensation you can get when, however scary something is, there is a perverse desire to do it irrespective of what is going on in your stomach? Call it ego, call it foolhardiness, call it what you wish, although there is something inside of us all that just wants to conquer and accomplish. Perhaps it’s just that insane human trait that needs to push ourselves beyond our comfort zones to feel alive. 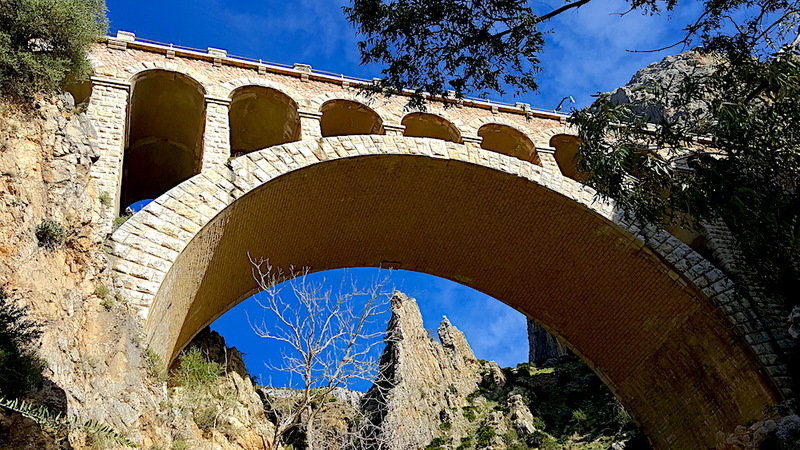 On first viewing, from the safety of the road, you can look up to the famous Eugenio Ribera’s Aqueduct and get a sense of what the walk would be like. 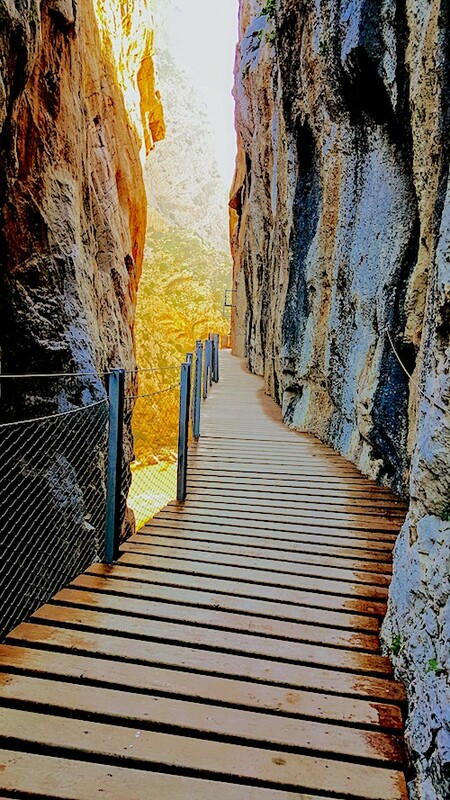 And from afar the boardwalk paths that hug the magnificent rock faces of the Desfiladero de los Gaitanes – Gorge of the Throat, look too incredible for words. 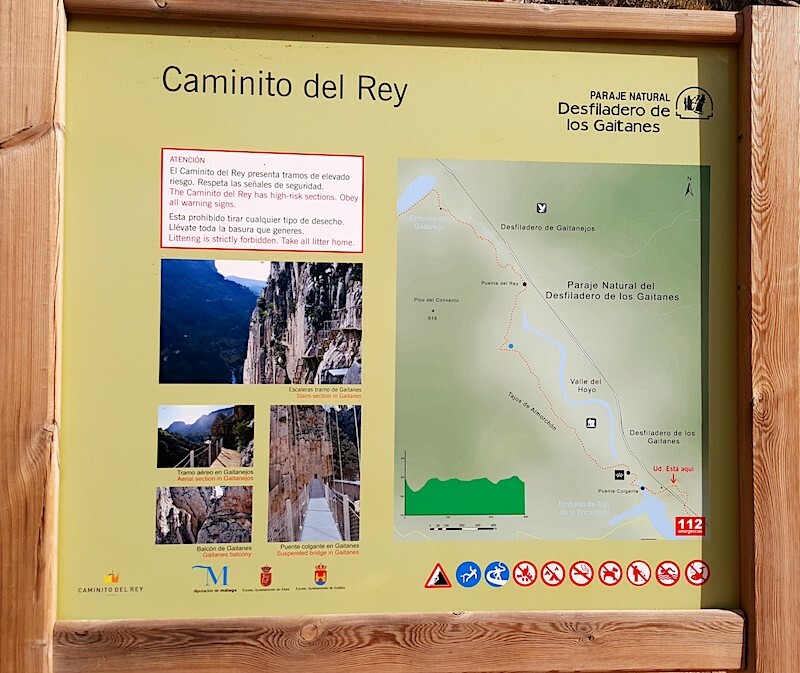 Tiny lines that seem to decorate the rock, with ant-like images of walkers who have taken up the challenge of hiking El Caminito del Rey. I felt a mixture of ‘OMG I couldn’t possibly’ to ‘Yes, come on! I’ll have me some of that’. In truth I’m not sure which one came first, the fear or the anticipation, although one thing is for sure, my desire to try the walk was greater than my fear – at that point! Later that night I started to do some research to identify what was involved and whether I was fit enough to do it. I found this great website which is full of information, images and a place to book up your tickets. The pictures looked incredible although strangely they started to engage my fear with their terrifying suspension, boardwalks seemingly hanging in mid air, without any visible anchors! Except I rationalised that hundreds of people do this walk every day, so surely it must be safe. Still there was something inside of me that still wanted to do it. So I pitched it into my hubby who took one look at the website and fuelled by his vertigo said, ‘Not a chance in Nelly’ or words to that effect. So there was my dilemma – I could do it, although I’d be doing it alone. When my mum offered to buy it as part of my 50th Birthday, I jumped at the chance. We love to buy experiences and not gifts that will hide away in a cupboard unused. So what a perfect present. My fears were three-fold; was I fit enough, was I courageous enough and how would I fare alone? Myles and I have been travelling Europe in our camper full-time for two years now and it has been an incredibly enriching experience for this little Miss Safety girl who used to like her roots. In that time I’ve learned the basics of seven languages, toured through US on the back of a Harley Davidson, driven up and down mountain passes and kayaked down rapids. Surely my confidence was great enough that I could tackle this walk – which is after all only 7.7km (that’s about 5 miles in UK money). Although having made a commitment to myself – and my mum, I was determined to give it a go, as life is just too short not to have amazing experiences. So I tentatively pressed the send button on my €18 online ticket purchase and preparations for my walk began. As always, I knew that the journey would be so much more than treading the boards – it was about overcoming my fears. The day arrived and we found a great wild spot to camp for the night, only 10 minutes drive away. So with my body strapped and wrapped as if I was about to climb Kilimanjaro, Myles dropped me off at the entrance for the walk. Not being completely clear as to where I would meet my group, I set off to the anticipated rendezvous point. It was strangely emotional as I saw our camper drive off, leaving me there. I was so used to doing things together – being alone left my inner child feeling vulnerable, although in truth I had little time to indulge her as my first challenge was slap bang in front of me. A low and seemingly long tunnel with no lights and a no Torch App on my phone. It felt so symbolic. I was in the dark, not knowing where I was going and with a long path ahead of me. And yet contrary to that, the pinhole light some 1/2km away really was ‘the light at the end of the tunnel’; hope that my darkness would soon end! With affirmations running in my head about how ‘I am strong, confident and capable’, I forged ahead, talking nervously into my GoPro that would record my journey. With the tunnel nailed, it took just another 10 minutes to find my rendezvous point at the main Control Centre. I’d chosen to go for a 10.00am Guided Walk, so that I was guaranteed to be with others and have the relative safety and humanity of like-minded souls. Donned with safety hats, which I must admit didn’t fuel my confidence, and a Ref-Link radio and ear phones, we were ready to start our journey. Now there was no going back. With Marcelo, our Spanish Guide who translated into English for me, we were on our way, into the depths of this little known Caminito, whose soil had been blessed by a King almost 100 years ago. The boardwalks – of which there are two sections both of which are about 1.5km each and have been skilfully reconstructed after the death of five people. A complete refurbishment of the walk took place between 2000-2015 making it a safer place to walk. Whilst the height is breathtaking and the views beyond adjectives, the catwalks are very secure, wider and more robust than I imagined. 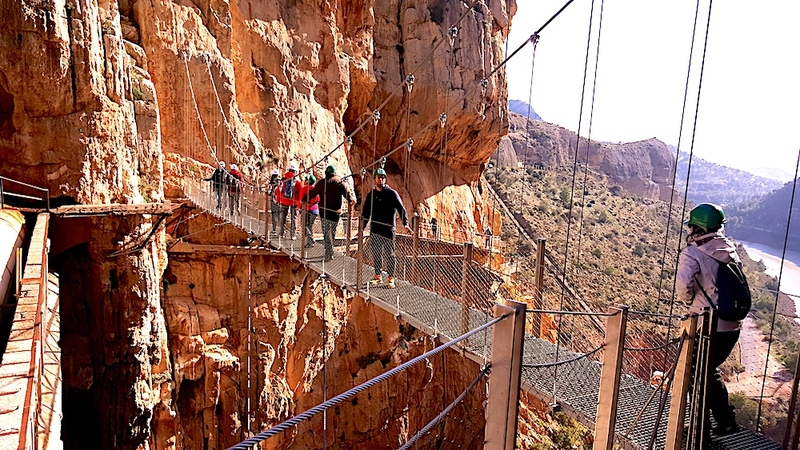 The wire fencing and cables keep the suspended paths secure and there is simply no way you can fall or wobble. The website photographs certainly conjure up a walkway from hell in your imagination, which is simply not the reality. With each step I grew in confidence and my nervous chatter into the GoPro subsided into a mindful silence as the scenery in front of me took my breath away. Hundreds of vultures circle overhead, gliding on the thermals and the sound of the river coursing its way thunderously through the narrow gorges makes the walk an orchestral symphony for your senses. My fears simply didn’t have any space to control me. With a glass viewing platform to test your nerve, tales of 19th Century sailors who worked in the gorge to satiate your inner historian and the sight of 23 million year old fossils – your anxieties soon disappear. 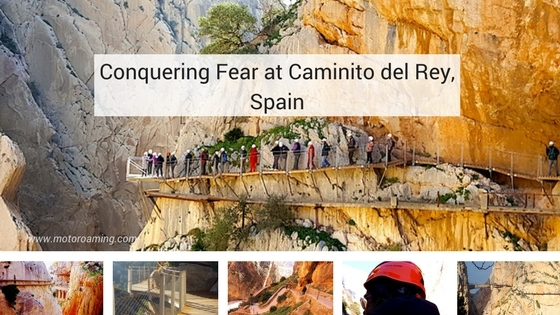 The blend of ancient and modern Caminito stories are mesmerising and make your efforts to tackle this walk, so worth it. And what of my fears? They evaporated within 30 minutes when I saw how easy the walk was both in terms of safety and my fitness. 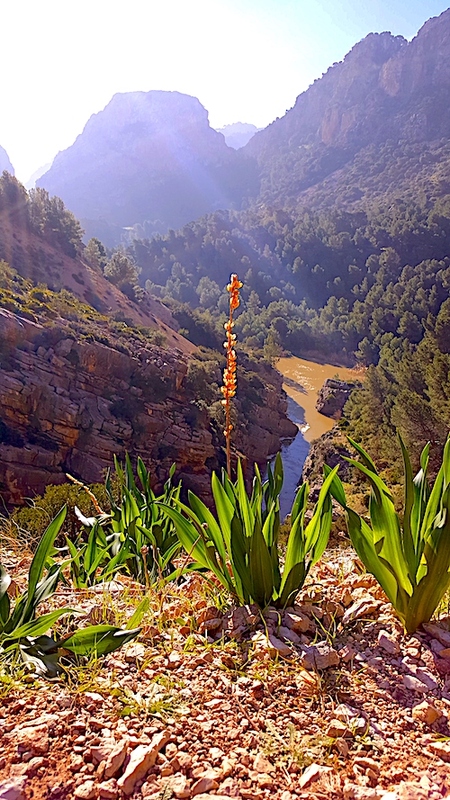 The most strenuous part of the hike is actually the 2km after leaving the gorge to El Chorro. And given that even with a few stops along the way for drinks and photos, it’s no more than a two hour walk from one Control Centre to another. And I would add, this is done at a gentle amble rather than a Rambler’s purposeful stride. Then there is a strange sense of disappointment when I reached the final bridge as I realised it was over and that my return from the hidden canyons of Narnia meant I was back in the real world. And then I reflected on my feat – not my feet that had trodden the boards with the deftness of a gazelle – no the feat of my achievement and completing this incredible walk whilst learning about its secrets. Fear paralyses us in so many ways with its deep-seated presence somewhere in our guts. It holds us back from living our life to its full potential and from doing things that could bring us joy, happiness and untold riches. Fear is only a figment of our imagination, developed into scenes of horror by our minds and is so rarely the reality. When we push beyond our fearful voice we can experience beauty beyond words. What is life, if not to embrace all of its faces and to learn about the extraordinary story that the world has to offer. Movies and encyclopaedias have their place, although they cannot begin to replace our participation in all that this magnificent place has to offer. 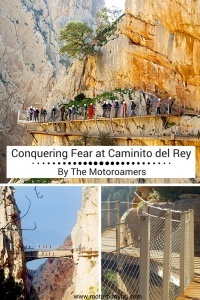 El Caminito del Rey? Come! It’s amazing. My visit was in January 2018 and it was cold although quite sunny. You are in gorges for 2/3rds of the walk, which don’t get much sunlight, so do wrap up in layers. The paths were dry, although if there has been rain, ensure you wear robust footwear. I suggest that you book your tickets on-line through this website rather than buying at the Control Centre, as you may risk not getting the time slot you want, as it does get booked up. Then you’re having to wait around. You can choose half-an-hour slots, from 9.30am up until 3.00pm. The earlier times are good, as you can park more easily and get a quieter experience, although the trips are scheduled in 15 minute slots so you are never on-top of one another. Only take a small rucksack with water and snack bars. You have a couple of short stops for refreshments, although there are no facilities (including toilets) once you are in the gorge. There are though toilets at the Control Centre office and again at the end of the route in El Chorro. 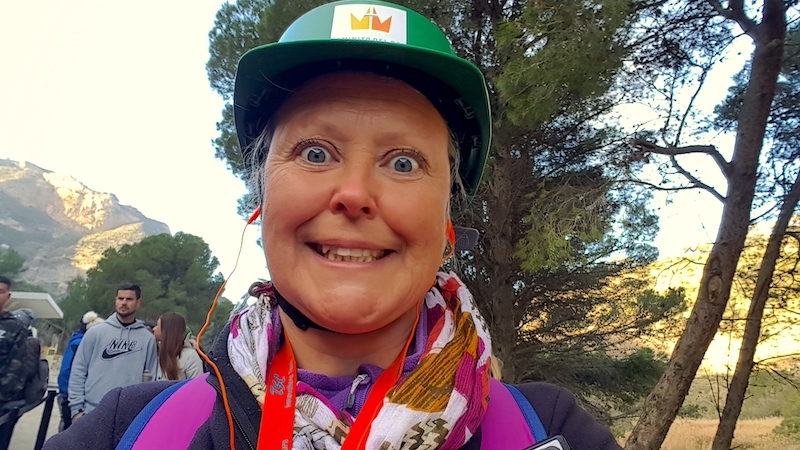 Your phones have no signal in the gorge until you reach El Chorro, although there are plenty of people around if you decide to walk alone and you need help. If like me, you are walking alone, going with a group with your own Guide is great as you get to learn so much more and ask questions. It felt like a more rounded experience than just simply just doing the walking. Tickets for going alone are €10 and with a Group are €18. The walk is one way – north to south and not circular. 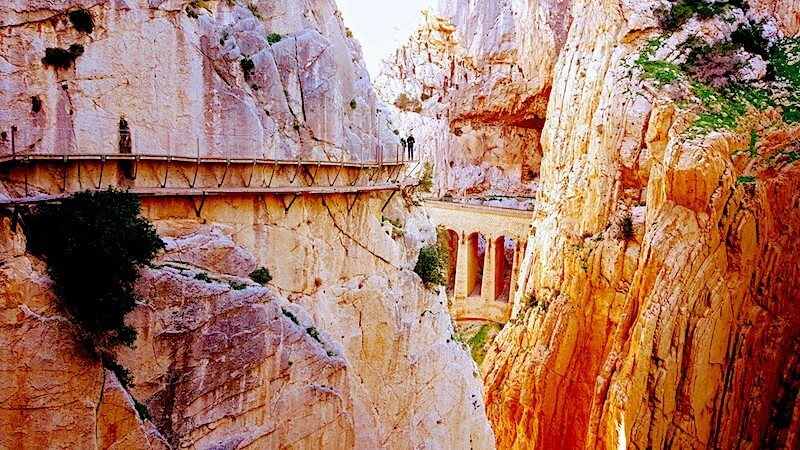 It STARTS at Ardales – North Entrance and finishes in El Chorro – South Entrance. This North Entrance though is NOT where you meet up with your Group. You have two routes to take to get to the main entrance, where you present your ticket and rendezvous with your Group. You can either go the 1.5km route, which takes you 20 minutes where you go through a long tunnel of 1/2km. Alternatively you can go on the 40 minute route which is about 2.7km and it has a shorter tunnel. So if you dislike the dark and feel claustrophobic, then you will need to factor in the longer route or simply take a torch with you. You need to rendezvous with your Group at least 15 minutes before your scheduled slot, as you need to register and go through a safety briefing. So make sure you allow enough time to walk there and arrive in plenty of time. When you arrive at El Chorro there are scheduled buses that run throughout the day that will take you back up to your car, if you parked it at the North Entrance. Alternatively you can park at El Chorro and catch the bus up to the starting point. It costs an additional €1.55 for the bus. Your Guide will leave you at the bridge at the end of the Gaitanes Gorge and you will walk the final 2.1km back to the Control Centre alone. Strangely this is one of the more strenuous parts of the walk with lots of steps to negotiate. Refreshments and toilets are available at the end. And finally, if you’re in the area for a couple of days – I would strongly recommend doing it for a second time to really appreciate the walk. I was aware of my sense of awe and photograph taking and I think for a second trip, I would certainly have a more connected experience. 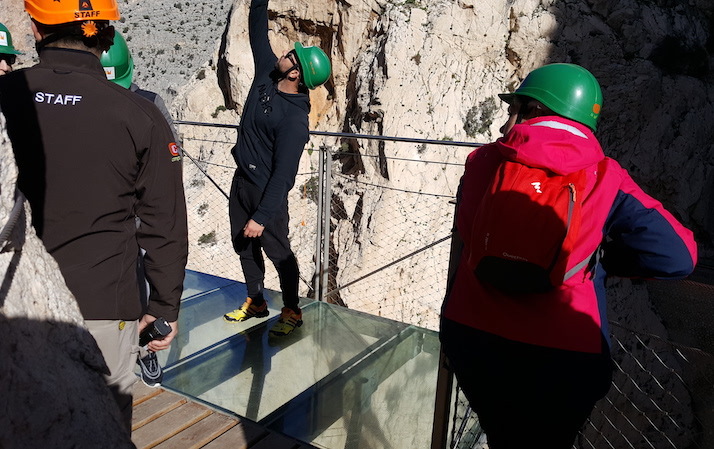 Olive Branch Camping – El Chorro. Official camping close to the Southern Entrance – just for tents. Check out our bird’s eye view video of this stunning walk. Amazballs. This is an amazing post and you are amazing person! True adventurer. Maybe I should do something like this to overcome my fear of highs. This looks and sounds like a beautiful and frightful experience. Your pictures are absolutely breathtaking and amazing. I bet you are beyond proud of yourself for doing what you did. I would love to try doing this, thank you for sharing. Hi Karen. You’ve fired our imagination now. Just wondering whether I am fit enough for it! Can you estimate how many klms the UP parts are. I’m OK long distance on the flat but get a bit puffed on the UP bits. Thanks. Thank you for this post, this was informative about how to go and get the best deals. Secondly, omg I can’t believe you actually did this. It looks so scary but amazing at the same time. Your photos look amazing and it looks gorgeous. I adore your photos. I am not sure if I would want to conquer my fear of heights to do this but I so admire you for doing it. This looks amazing and great photos! Good job for going on your own! Not sure if I could muster up the courage to do it! This looks scary yet amazing for adventure seekers. I had goosebumps with anxiety looking at those pictures. I would certainly like to try it sometime though. 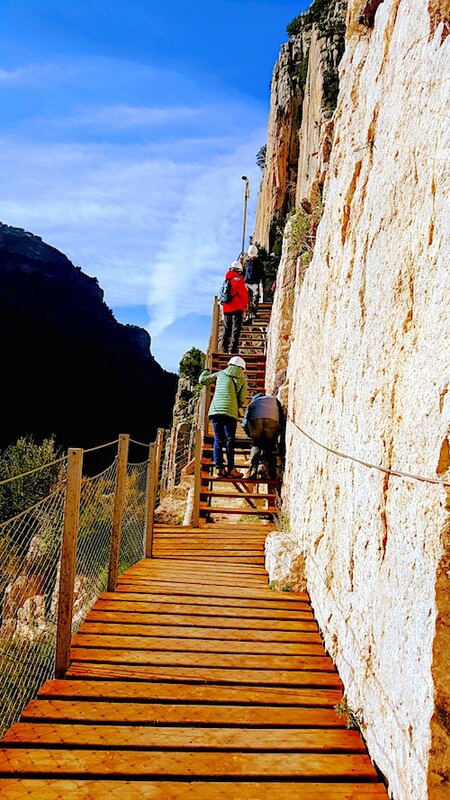 I had heard about a similar hike in China, where there it is much more narrow and does not have a railing. No way would I do that one, but I think I could do this one and it’s much closer. Actually, I really want to do it because it looks amazing. I like your suggestion of doing it twice! Added on my bucketlist, wow! 😍💕😘 Never heard of the place before but now it is top of the list! This is incredible! I’ve nevwr heard of this place but I am so intrigued! Thanks for the info. That’s a beautiful and powerful piece. I felt like I was waving my cheerleading pompoms and chanting “Go Karen!” Wise words too about doing things once to face the fear, and again to enjoy the experience. The vid was great to get a sense of the space and its beauty. Trips like this which push our boundaries really boost us all, and I’ve enjoyed journeying with you tremendously. I quite enjoyed reading this. Both an inspiring story and practical guide! Congratulations for conquering your fears and doing this… and by yourself! I’d be so nervous but this also looks incredible! The views must be amazing, if you can relax enough to enjoy them! Ow, that look so adventurous, right down my alley 🙂 And kudos to you for doing this scary hike! Thanks for sharing this post, I have made a mental note to add this to my trip to Spain whenever that may be! I did the camino in 2000 with some sevillan friends. we did Camping on the free Camping area on the lake,did some climes up the rocks directly from the concrete trail and climed down in the Summer heat to the river to cool down. except of the train to seville we might saw 6 or 8 others…. for sure : now, everybody can join, but today I was nearly crying when i saw what they did with this peaceful adventure place. They call it progress Georg. Sometimes though maybe not for the better.